Something I tend to lose sight of as I'm thinking about wines in the $15-$30 price range that deliver a good amount of enjoyment and excitement is how universally interesting an outstanding $10 bottle of Cabernet is. Some time back a reader sent me a link to a retirement speech from NASA Astronaut Michael Collins. At the end of the speech he says that these days he spends his spare time "worrying about the stock market" and "searching for a really good bottle of cabernet under ten dollars." A lot of people will tell you it's impossible to find a compelling bottle of wine for $10. Don't even waste your time. And a lot of people would say the same after tasting the 2012 Columbia Crest H3 Cabernet Sauvignon. It's overly oaked. Too rich. Manipulated. Whatever. I've enjoyed wines from Columbia Crest over the years a great deal. I remember the first time I went out and bought a case of wine based on a Wine Spectator rating. It was for a Columbia Crest Grand Estates Merlot Harvey Steiman rated 90 points. You could find it for like $7. I bought a bottle and loved it. I then went back to Marty's in Newton and bought a case. I felt like such a mega deal hound! 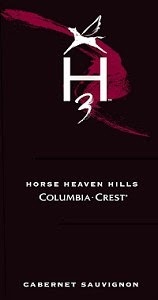 More recently Columbia Crest has introduced this H3 tier of wines above their Grand Estates offering. It's been a reliably nice buy for me as well - consistently in the 87-90 point range. The H3 bottling has a release price of $15 but you can find it for as little as $9.99. Today, Wine Spectator released (subscription required) a 92-point rating for the 2012 Columbia Crest H3 Cabernet Sauvignon. That's an insane QPR for a very popular category. A really good bottle of Cabernet for under $10? Could be. If you're sleuthing around for this wine online be aware that a lot of retailers will list this without a vintage due to its massive 160,000 case production. Question of the Day: Have you tried this wine or prior vintages of Columbia Crest H3? What did you think?